Now here's where things started to get interesting for me with this season. The arrival of Genevieve and the re-examination of 9/11 has led to some good moments in the last few episodes. But it wasn't until Tommy saw Jimmy in the DVD footage -- after the first tower fell, which is where and when Tommy has always believed Jimmy died -- that I really felt like "Rescue Me" was back. Tommy's inability to cope with Jimmy's death was always the core conflict of the show -- the deaths of his brother, his father and even his son simply don't matter as much, because the series is about the emotional costs of being a firefighter -- and Tommy discovering that the death didn't happen the way he thought it did brings the show back to that core. Along the way, "Jimmy" provided the first good Sheila scene in forever when her therapist (previously a buffoon) explained how she projects her anger about Jimmy onto Tommy(*), as well as a great fight between Tommy and Lou where Lou pointed out -- as this season already has, repeatedly -- that 9/11 wasn't Tommy Gavin's own personal tragedy. (*) As with the fight in last week's episode (which I never got around to reviewing) between Mike and Franco over Franco's conspiracy theories, it's remarkable how much more interesting the comic relief characters on this show become once the writers start to take them seriously. I still want to be rid of both the bar subplot and Black Shawn's relationship with Colleen, but the rest of the show -- including Lou's hilariously disgusting apartment, and another memorably weird rescue, with the car sinking into the street -- is really clicking right now. Enjoyed the show a lot. I agree, the 9/11 reflection really helps center the characters and the show. For a bit, I thought they were going the route of "Jimmy faked his own death," but glad the psychic's comments seemed to indicated that Jimmy did, in fact, die. Not as excited for next week's previews. As much as I like Michael J. Fox in this role (and in general), his storyline brings back Janet and the Tommy/Janet craziness that I hate. I'd prefer to stick with the firefighters and their stories in the house. It's interesting that you say that about the bar and the relationship. I feel like we need that comic relief when dealing with something as serious as the subject matter this season has presented. I've really enjoyed Mike's numerous blunders when coming up with a theme for the bar. I try not to be the kind of person to link whore, but I totally am going to link to my review now because I thought this was the best the show has been since probably ... early, EARLY season three, and I, too, think it's really clicking along. Not so sure I'm crazy about the psychic who's faking it but is also really a psychic, but maybe Leary and all have always planned to add in a supernatural element. I have no problem with the bar ridiculousness, because I agree it adds a little levity to the seriousness of the rest of the 9/11-Jimmy storyline. And I just LOVE that Sean continues to be dumb, and yet his dumbness makes me laugh. He plays that character so well. I finally got what they were doing with Sheila in this ep, and for the first time in multiple seasons I liked that her therapist pointed out how much anger she transferred to Tommy when Jimmy died. Still think Janet's an obnoxious harpy (and i find it interesting that the psychic looks so much like her) but the rest is clicking for me. I completely agree about the conversation last week between Franco and Mike. This is my first season watching the show and I really had no use for Franco at all until that scene. It was the first time I saw him as a real "flesh and blood" character and not just some big mouthed cartoon. And I have a hard time believing that Mike and non-black Shawn are so stupid, but I guess it's been established during the first four seasons that they are. I still like them, though, especially Mike. And I'm glad that Gina Gershon seems to be gone, as her character seemed completely pointless to me. This week's episode was a little dull to me outside of the Jimmy reveal. I still don't like the Black Shawn/Colleen story either and Sheila still grates. Really looking forward to next week, though! And I just LOVE that Sean continues to be dumb, and yet his dumbness makes me laugh.That R.E.M./MRI joke totally cracked me up :-) I think this season is firing on all cylinders: comedy, pathos, all of it. I hope we find out what really happened to Jimmy. Seeing him in that footage was eerie (seeing the real footage was a kick in the gut, too). I'm still waiting to see this episode. Tried to watch it online earlier today, but it wasn't up yet. Maybe I'll have a chance to watch it tomorrow On Demand. Anyway, I just wanted to say I'm glad you're blogging about this show in case the number of comments (recorded interest) has any impact on which shows you'll write about here. John Scurti's character is named Ken. The nickname commonly used derives from his rank and should be spelled 'Lieu'. I love all the characters on this show. Franco's best stuff was with the slightly crazy brother of his last girlfriend. And the time he... ummmmm... got that ring stuck on his sensitive area. Priceless stuff. I have always enjoyed Sean and Mike and their ability to convince me they are that dim witted. Plus constantly thinking of bizarre things to discuss. For me the weak link in the show is Tommy and anything that has to do with his constantly taking his pants off. I refuse to believe that the women on the east coast find that man remotely attractive. The show has always been at it's best when it has dealt with 9/11. I am so glad it is revisiting that again. Franco and Mike's argument was great and their later talk, and so was Lou and Tommy's argument. And great moment for Sheila too...all of a sudden she became this real character. Does anyone know if the Irish Wolfhound is Denis Leary's or not? Off the subject I know but I'm curious. I think he is a big dog guy, just wanted to know. Thanks. Why would a life long New Yorker be wearing a Minnesota North Stars t-shirt? There had to be a reason for that, right? Finally got to see this episode yesterday - definitely the best of the season so far. 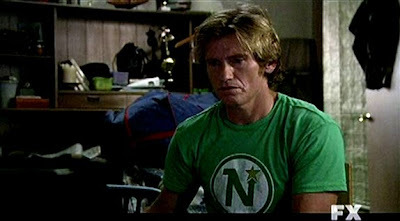 As for the MN Northstars shirt, I took it to be a statement of his serious hockey fandom, not about anything regional. Even people (like me) who don't know much about hockey knew it was an abomination that major hockey hotbed like MN should lose its hockey team to freakin' Texas, of all places. About the dog, I've heard Denis Leary state his love of Irish Wolfhounds. That dog may indeed be his (I've wondered that myself). HIMYM, "The Three Days Rule": OMG. FWIW, ROTFL. 30 Rock, "The Ones": Puerto Rican! The 'Lost' clip show: wha happen? American Idol: Thoughts on Disco Night? Sit Down, Shut Up: Thoughts? Southland, "Mozambique": It's my baby in a box! American Idol, Top 7 results: Judges' Save? Scrubs, "My Soul on Fire, Pt. 2": Hey Ya!